Broken Tower Redoubt is a ruined fort occupied by Forsworn. There are three exterior zones controlled by the redoubt, the ground level exterior, the mid level exterior, and the top level exterior. There are two separate interior levels both named Broken Tower Redoubt, the ground level and the upper tower. It lies along the road between Karthwasten and Rorikstead. It is a dangerous place, making travel between the two towns a hazardous undertaking. The guards of Markarth know this and will inform you of the danger, "Beware the region northeast, across the river. 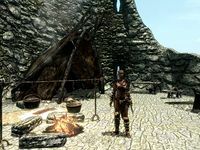 Forsworn have taken refuge in Broken Tower Redoubt and Red Eagle Redoubt." Just past the western edge of the fort there are two blue mountain flowers, a purple mountain flower, and two juniper trees growing by a dirt path. The path leads to Liar's Retreat. There is one Forsworn patrolling outside the fort on the road. There are another two Forsworn on the middle level exterior that will attack with bows. If they lose sight of you, they will descend through the ground floor and try to find you. There is a blue mountain flower growing by the door, and two purple mountain flowers growing near the western end of the fort. The ground floor door opens to a short twisting tunnel. After two turns it opens to a large room, with two Forsworn, one on the lower level and one on the higher level. There is a table to the left with two bottles of Nord mead, and straight ahead is a small room with a random potion of magicka on a barrel and fifteen bottles of Nord mead on a set of shelves. Opposite the first table is another with a lute on it. To the right of that table, in the darkness, is an adept-locked door leading to a storage room with thirteen bottles of Nord mead and a random potion of stamina on some shelves, another two bottles of Nord mead on a barrel, and a chest. Above the chest are seven hanging rabbits and a pheasant, with a further two pheasants on the floor behind the chest. From the main part of the room there are two sets of stairs. The one to the north has collapsed, but the one to the south is still intact. At the far end of the left-hand side on some fallen masonry are two bottles of alto wine and hiding between two barrels is a Dibella statue. While to the right-hand side is a door leading further into the fort. In the next corridor, there is a spiked wall trap with two pressure plates one on either sides of the trap, the first is hidden in some hay by two barrels on the approach and has a table next to it holding a bottle of Alto wine, a wooden plate with a salmon steak and raw salmon meat on it and a large coin purse. The second is beside another two barrels around the corner, just before the end of the spiked wall located to the right. After this is a corridor running in a semi-circle around a circular room. 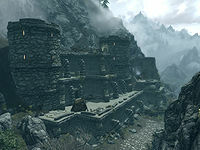 There is a Forsworn patrolling the corridor, which has two doors; one to the south that leads outside to the exterior middle level, and one to the east leading back to the main room. There are two single beds and four bedrolls, all unowned, in the circular room. On the shelves to the left from the first entry is a copy of the Block skill book The Mirror, a frenzy poison, a satchel, and an empty strongbox and some bottles of alto wine and wine. On the cupboard shelf after that is a solution of enhanced stamina, which is worth over 1,000 gold, several bottles of wine and a bowl on top. By the end of the bed beside the cupboard is a crate with three loose septims, a large coin purse, a silver ring on it, and sometimes a random potion, and by the other bed is a novice-locked chest and a table with a mead barrel and a bowl containing bread. There is also a wardrobe and a second table in the room. The corridor to the east leads back to main room, above the collapsed staircase. There is a table with a random potion of healing and a bottle of alto wine. The corridor leads to the base of the east tower, passing another exit to the middle exterior level on the left which has a barrel with a salt pile on top next to it. By the base of the stairs is a table with a salt pile and a drum on, also some shelves with three garlic, three loose septims, other food, a flute and another drum. Halfway up the stairs is a tripwire that activates some falling boulders. A Forsworn patrols this part of the stairs, and can be killed by triggering the tripwire at the appropriate point. This may alert two other Forsworn in the area at the top of the stairs. At the top of stairs is a room where another Forsworn waits. There are two unowned single beds in the room, a table with a random potion, a bunch of jazbay grapes, a haunch of venison, a bowl of tomato soup and a honey nut treat. There is another bowl of tomato soup and a fillet of salmon meat on some cupboard shelves, a set of shelves holding two flutes and drums, and an unlocked chest by one of the beds. There are more stairs on the other side of the room, with a pickaxe on the ground by the base of them, leading up to a third exit, past a final Forsworn. The middle level of the exterior is guarded by two Forsworn, one to the east and one to the west. On the eastern side is an empty table, a simple tent and bedroll. On the western side is a small camp, with a cooking pot, a grindstone, two hay piles and a table with three iron swords, an iron war axe, and a random war axe on top, and a pair of iron boots underneath. There are two entrances to the interior from this level one at each end. The top level exterior is the only way to get to the top of the western tower. It is guarded by a single leveled Forsworn and there are two tables; one with a hunting bow and forsworn arrows—they may have fallen through the table and be underneath, and the other with a random leveled potion. 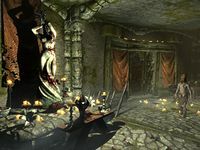 The top level of the tower contains a desecrated statue and shrine to Dibella, guarded by a Forsworn Briarheart, there is also a lightning rune in the middle of the room. The top level is split into the main chamber and a side bedroom. There is an expert-locked cell off the main room that is empty (if you are here to rescue someone they will occupy this cell); the Briarheart carries a key that unlocks the cell. There is a table to the left of the entrance that holds a decapitated skeever, a copy of the conjuration skill book Liminal Bridges, a random healing potion, two pieces of canis root and a copy of Ancestors and the Dunmer. There are two random frost weakness poisons, a bottle of wine and two bottles of alto wine on the shelves beside that. On the floor there are seven sprigs of snowberries and a bunch of jazbay grapes leading to the statue and shrine of Dibella. Beside the entrance to the bedroom is another set of shelves containing three flutes, two drums with a lute next to it. The bedroom, located to the north, has an unowned double bed, an unlocked chest, a table, a cupboard and, an end table with some cheese on top. On the table is a bowl of beef stew, a silver emerald necklace, two bottles of alto wine, a copy of The Firmament, a bowl of potatoes, a plate with a grilled chicken breast on and a troll skull. On the cupboard shelves is a random magicka potion, two leather strips, a canis root, a sweet roll and some horse meat. It is possible to gain access to the highest level of the Broken Tower Redoubt without going through all the levels by climbing down the mountain behind the castle. If you have started both The Heart of Dibella and The House of Horrors, and the Radiant system has chosen Broken Tower Redoubt as the location for Logrolf the Willful, both he and Fjotra will occupy the same cell in the tower. 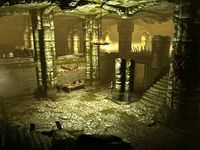 Despite being occupied by Forsworn, there is a large amount of Nord mead to be found in the lower interior, 34 in total. There are a couple of ore veins nearby; there is an iron ore vein on the road to the west (if not, try east past the road sign), and a corundum ore vein to the northeast with a skeleton and its pickaxe. There is another corundum vein outside Liar's Retreat to the northwest. Aside from the Briartheart, all Forsworn enemies encountered here are female.